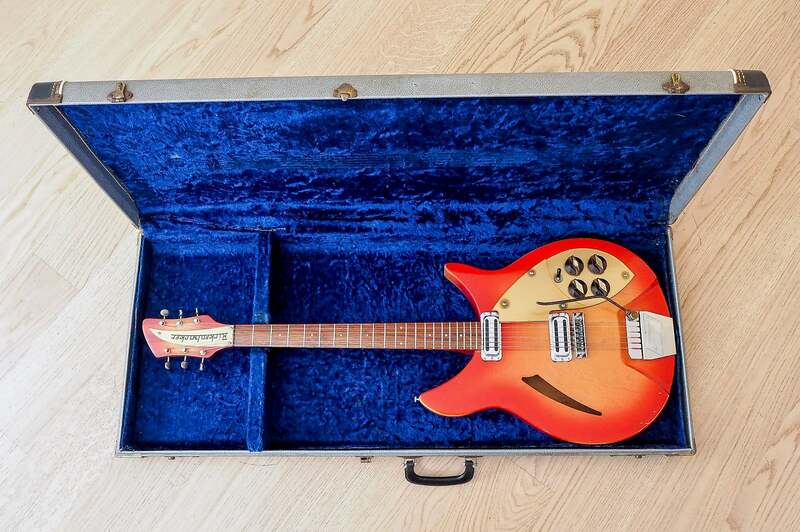 Up for sale, a 1961 Rickenbacker 335 Capri in exceptional condition and in perfect working order. 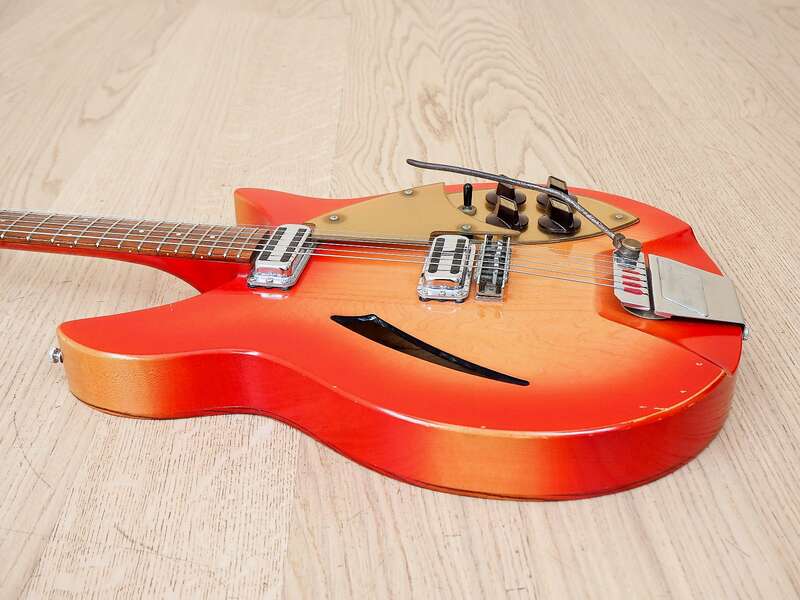 A well cared for example sure to satisfy discerning collectors, this Capri was produced very early in '61 with a host of notable features including a full 2 1/8" body depth, early Ac'cent vibrato, and original gold lucite dual-tiered pickguards and matching truss rod cover. 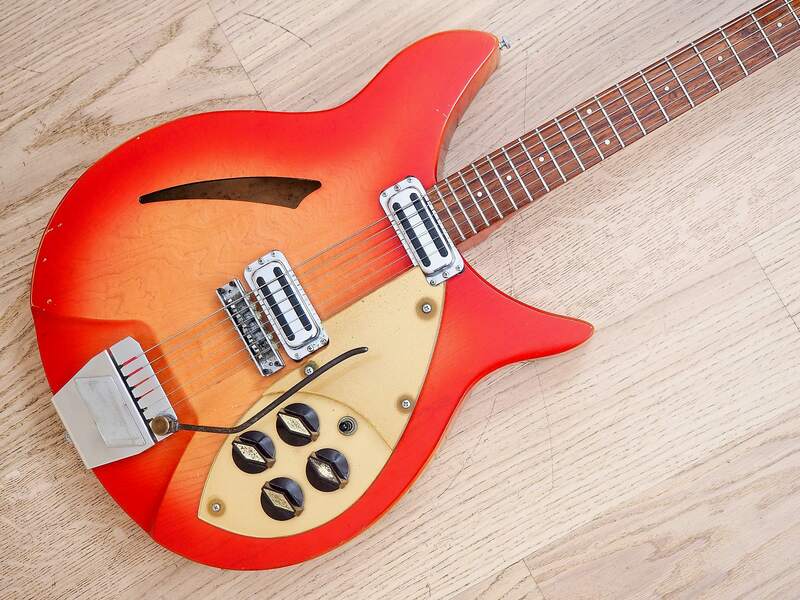 Finished in the original gloss Fireglo nitro lacquer, this Rickenbacker is the pinnacle of Mid Century design, with a distinctive European flair courtesy of Rickenbacker designer Roger Rossmeisl. 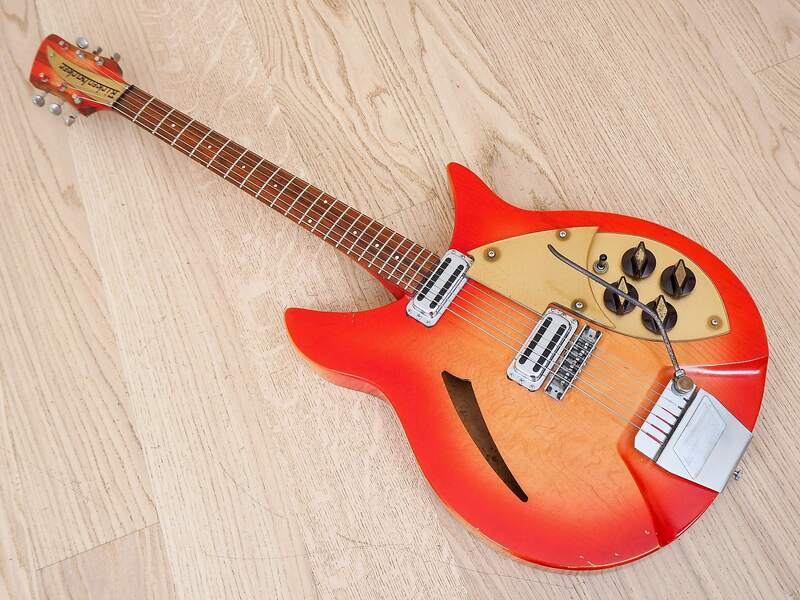 Tonally, the 335 Capri is a distinctive and impressive sounding instrument, with a very full sound and no shortage of warmth, detail, or sparkle. 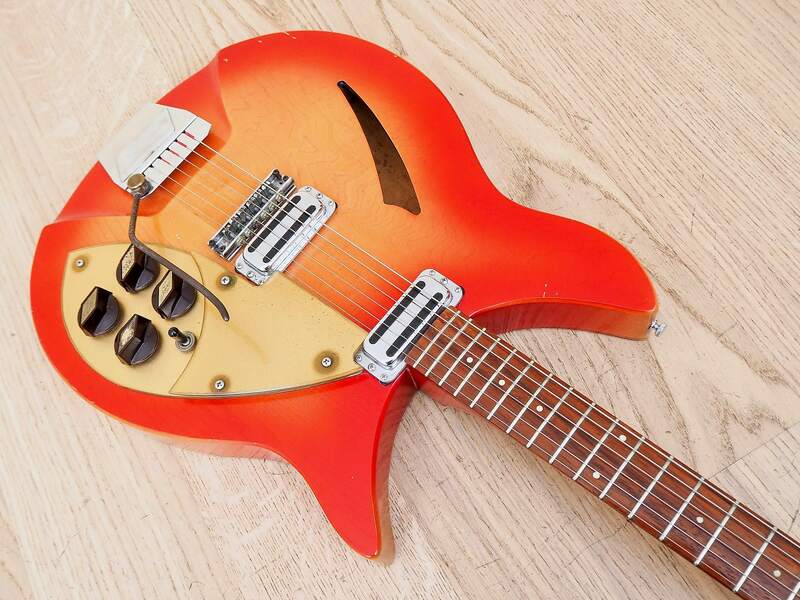 Never biting or thin, the guitar delivers a tonal palette in the parameters of what one expects from a later Ric model, yet with an articulation and volume not reproduced by later toasters. 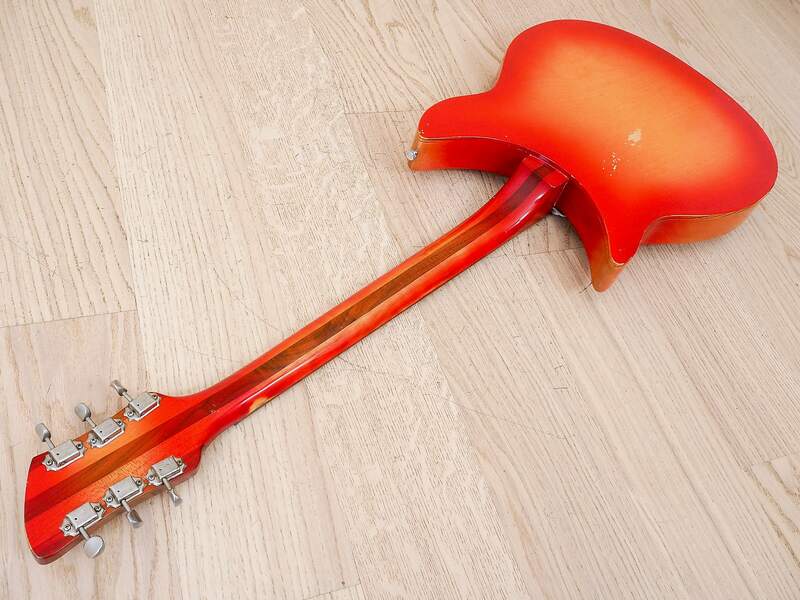 The tone controls work in reverse, with the darkest, smoothest tones with the knob at its max, and the most articulate treble with the knob rolled back. 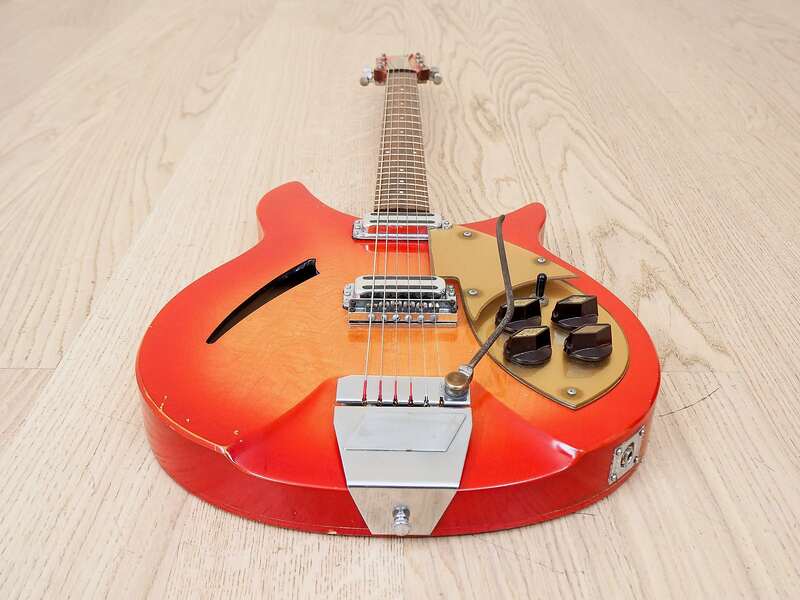 Both toaster top pickups have a distinct tonal character, and the body depth of the early Capri models allows for a richer and more powerful sound. 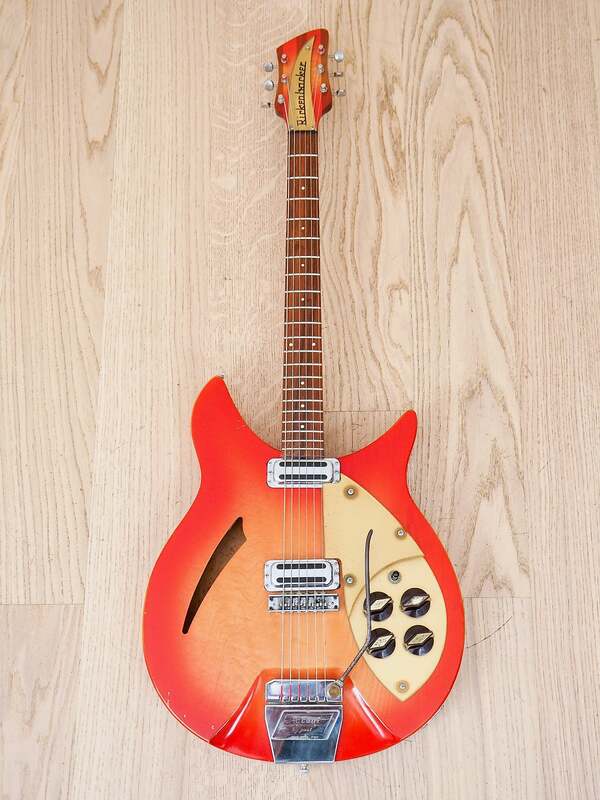 Weighing in at 7lbs 12oz and setup with Thomastik flatwound 12s, this Rickenbacker is dialed in to play its best with low action and accurate intonation. The maple neck with walnut center stripe has a slender and fast C profile which stays consistent in depth as you travel up the fretboard. It's an exceedingly comfortable neck and the Fireglo finish highlights prominent figuring in the maple along the profile. 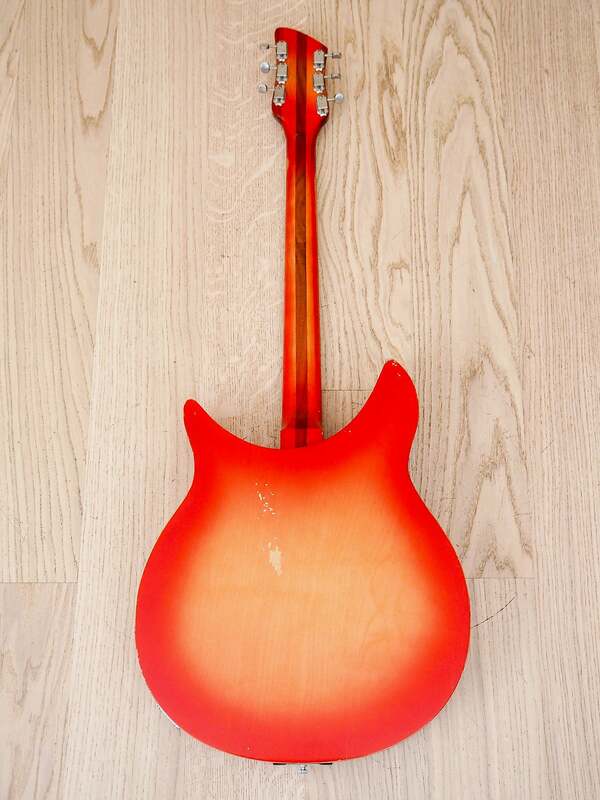 The finish is notably intact and smooth along the entire profile, with only a touch of palm wear through the finish on the bass side fretboard edge from frets 2-5. The lacquered thick slab Brazilian rosewood fretboard retains the original slender frets which are remarkably clean, showing only light, uniform wear on the crowns of frets 1-2, extending to fret 4 only beneath the plain strings. 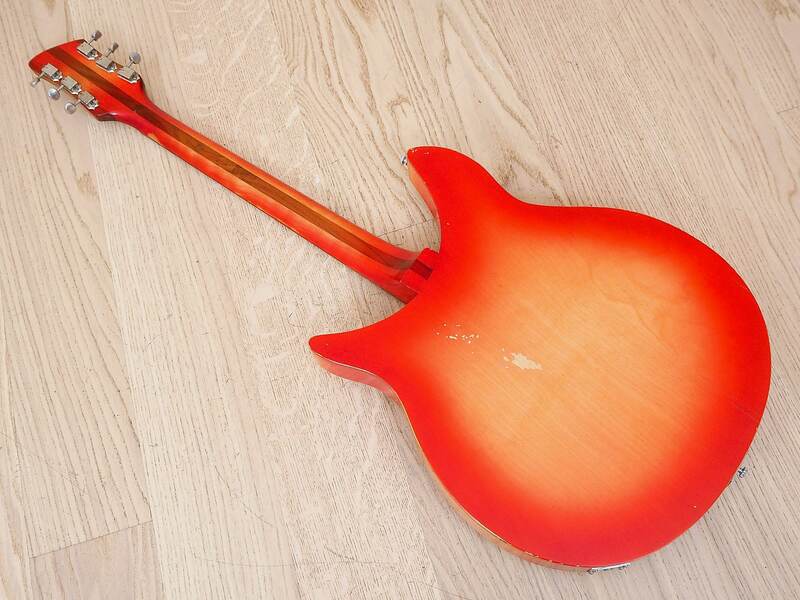 The frets show virtually no wear further up the fretboard, and the guitar plays cleanly in all registers. The scale length measures a full 24 3/4". 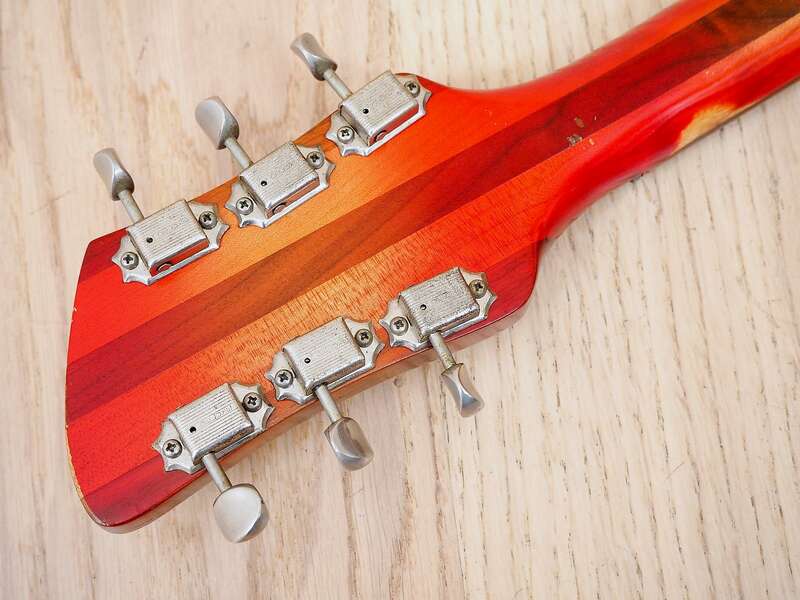 The original nut measures 1 5/8" in width, and the headstock retains the original Kluson Deluxe single line tuners which turn smoothly and hold pitch as they should. 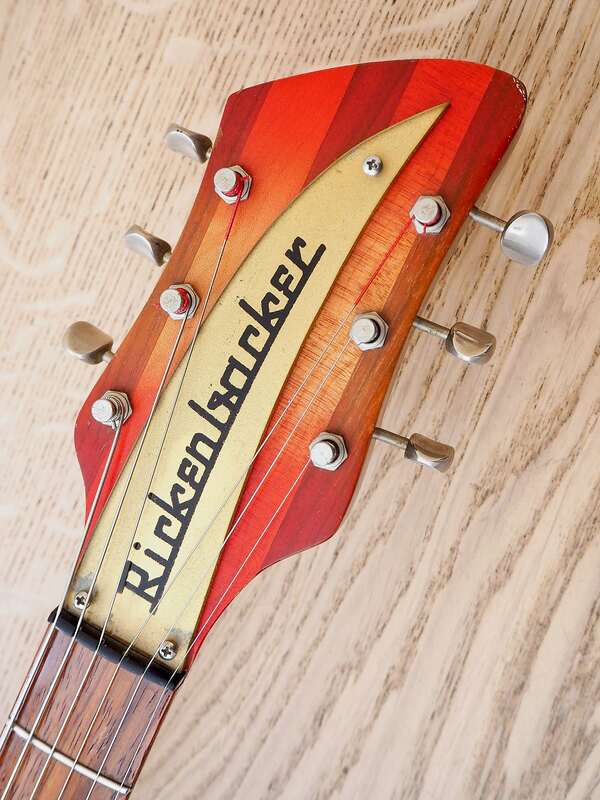 And of course no Rickenbacker headstock would be complete without the original gold lucite logo. 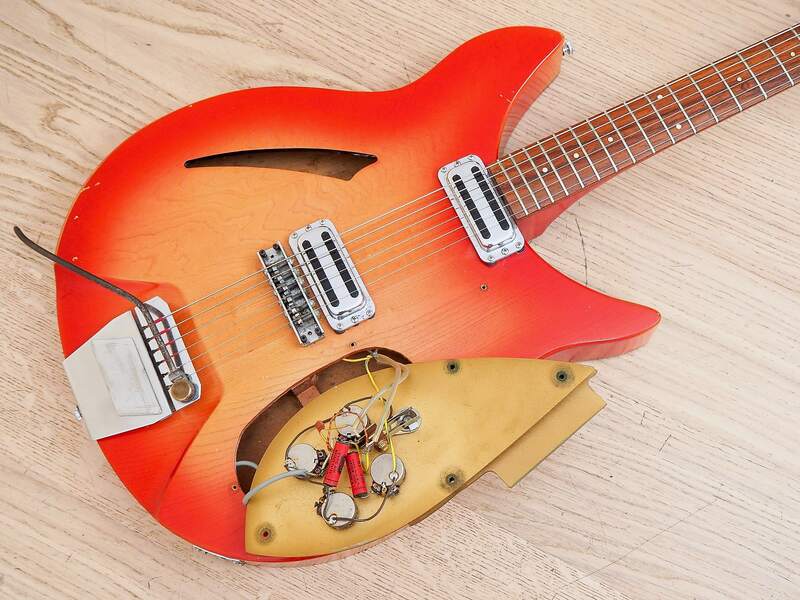 All of the electronics work as intended, with untouched solder joints, original "dynamite" paper-in-oil tone capacitors, and CTS pots which date to the 3rd week of '61. 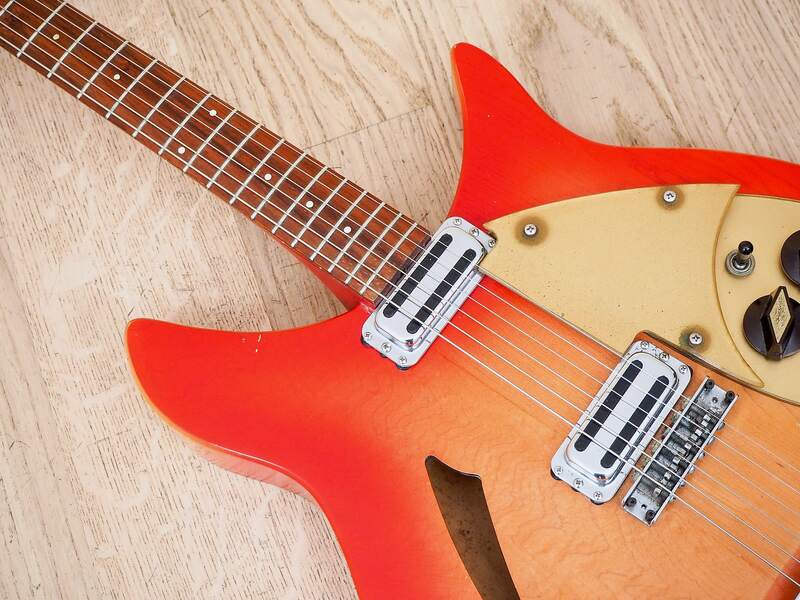 The original gold lucite dual-tiered pickguards are in great shape, and the original oven knobs and switch tip are present too. 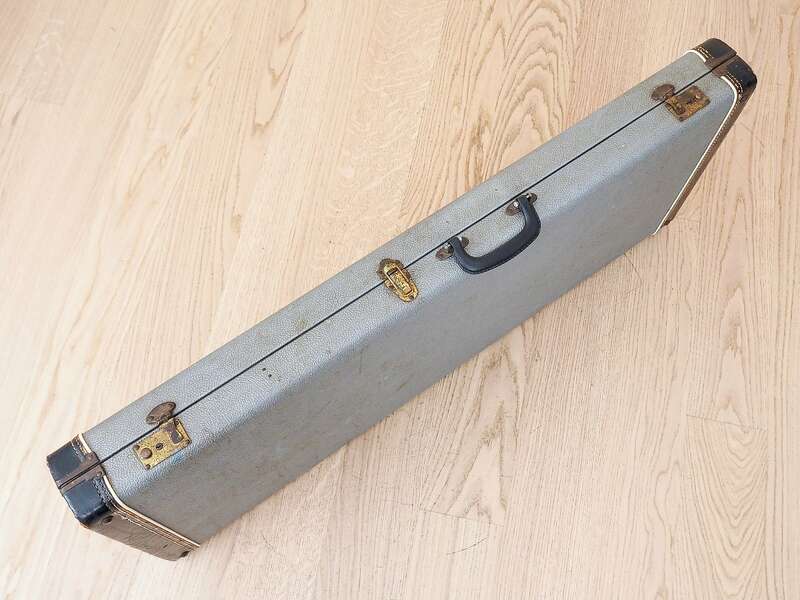 The original bridge with small roller saddles works in concert with the Ac'cent vibrato, which retains its original arm and actuates very smoothly for expressive warbles and modest dives, jumping back to the original pitch reliably. 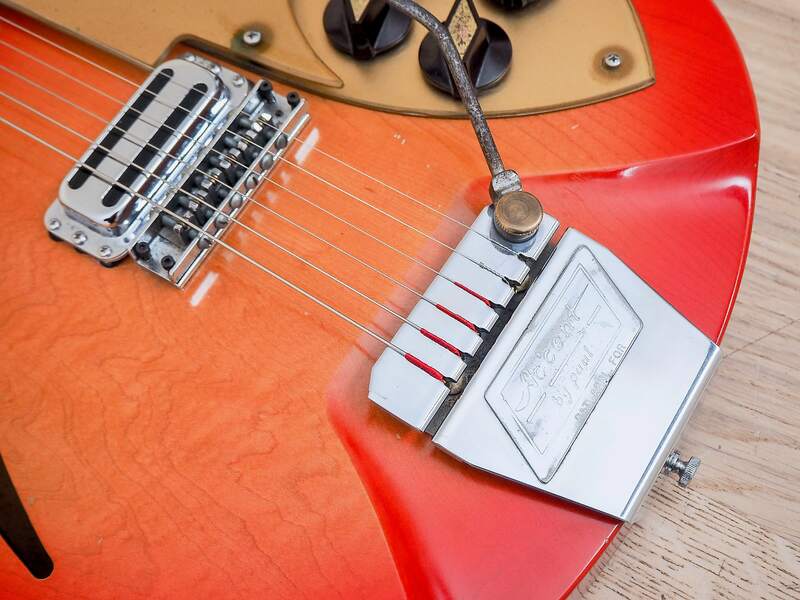 The chrome is clean on both the vibrato and original toaster pickups. 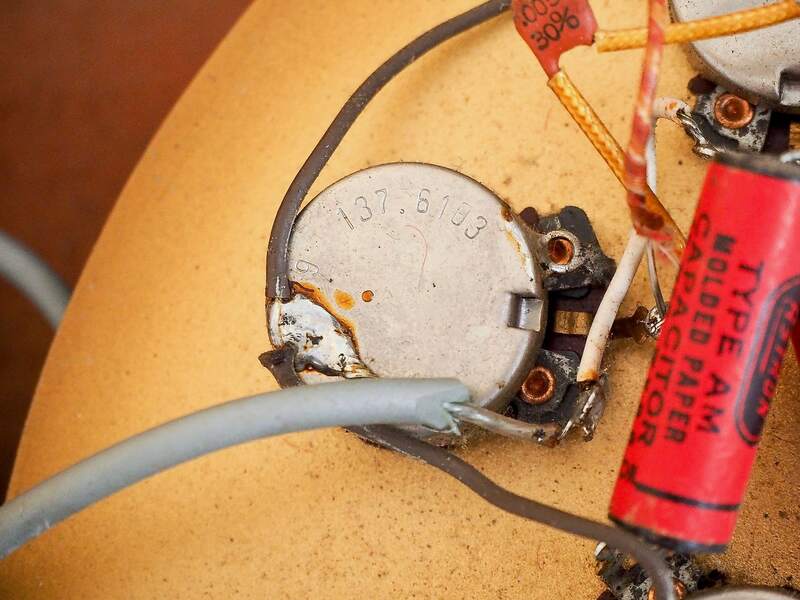 The mono jack plate has a four digit serial with a "C" letter typically denoting a '50s Ric "Combo" model, yet it appears original and the jack mounting holes are untampered. Cosmetic wear is limited to light targeted buckle rash central to the back, with just a couple small spots of wear through the Fireglo. 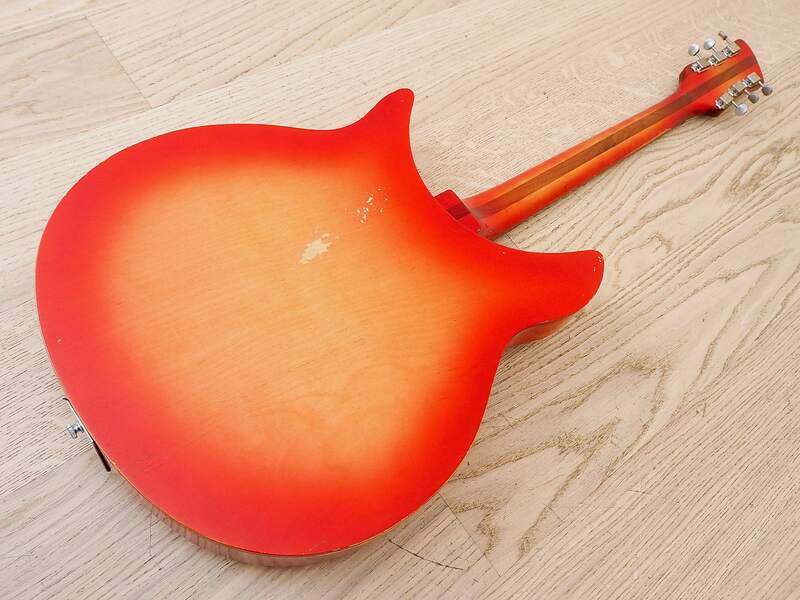 The top is very clean with prominent grain, and the body as a whole shows only a few minor expected nicks and dings and a couple isolated spots of light vertical lacquer checking on the back. 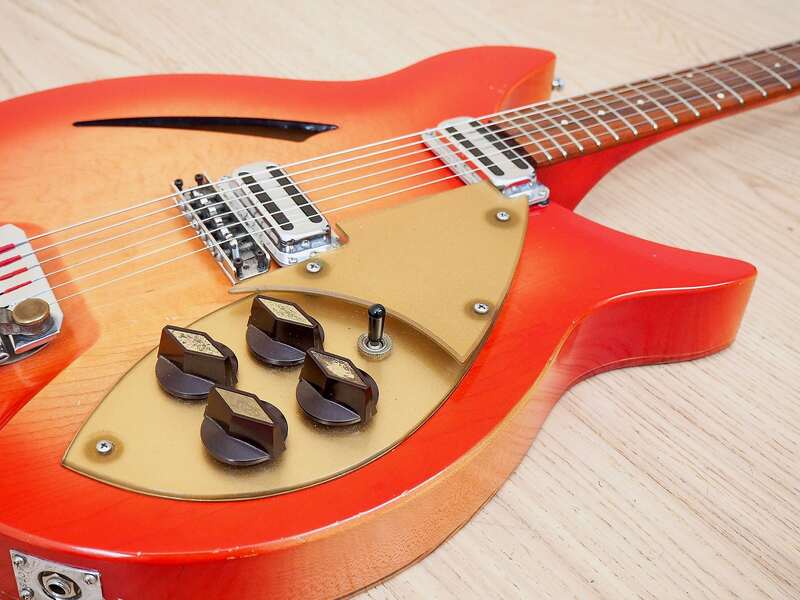 The Capri models are pure golden age Rickenbacker, with a feel and tone unsurpassed by subsequent models and a tonal range and expressiveness that's truly in a league of its own. 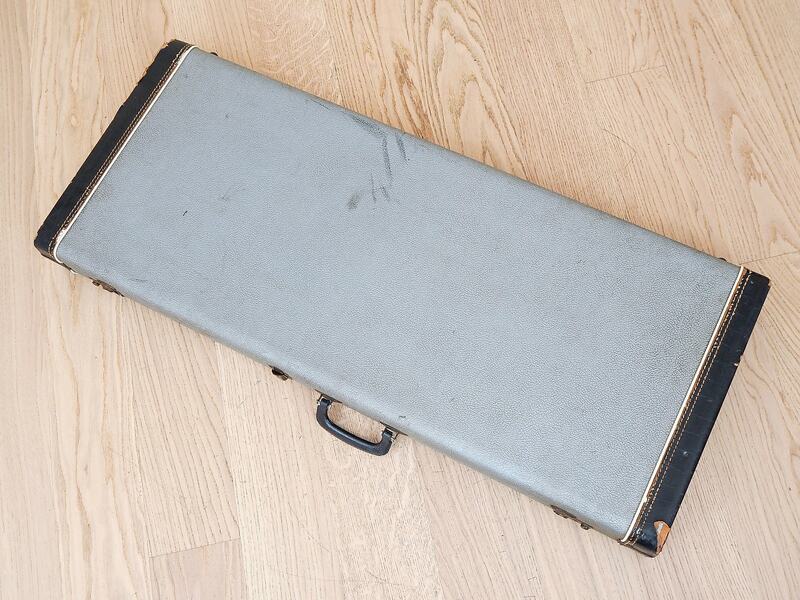 The original silver hardshell case with plush blue interior is included. Based on purchase price of $8,599.99 at 10% APR for 12 months. Excludes tax and shipping fees, to be calculated at checkout. Rates range from 10-30% APR. Choose from 3, 6, or 12 monthly payments. Select Affirm at checkout to get started.